One day in the middle of the barnyard, the chicken was strutting around (as most chickens are prone to do) thumping his chest. He was proudly proclaiming that his participation in the making of breakfast (by laying the eggs) was the most important (yes, I realize that the chicken should be a female, but work with me here). Then from the corner of the barnyard, the pig snorted, “…you know that’s kind of funny, you see, I am committed to making breakfast this morning.” Ham and eggs. So you have to ask yourself, are you the chicken or the pig? Do you merely participate, or are you committed? Over the past years several members of the Big Pig Racing team have had their lives changed in their fight against cancer. Brain cancer, bone cancer, breast cancer, and leukemia to name a few. As a result the Big Pig Racing family decided to put our off the bike skills to good use and host a mountain bike race to raise money for cancer research. 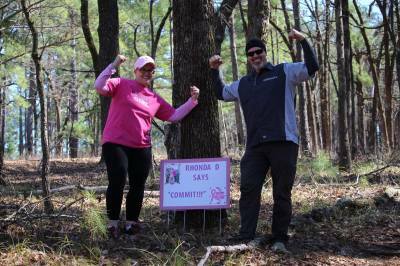 In January 2013 we held the inaugural “Kick Cancer’s A**’s” 6-hour MTB Race at Tyler State Park. As a result over $7000 was sent to three different cancer research charities. Because of the outpouring of support and funds, we knew that the 2014 and beyond events would continue to grow and need a more financially sophisticated approach for sponsors, supporting groups, and donations. To that end, we have formed the Big Pig Cancer Foundation as a Texas non-profit corporation with 501c3 status. This provides more transparency in how and where the funds are being used, and more flexibility in the cancer research programs we support. Just a bunch o' pigs playing in the dirt. 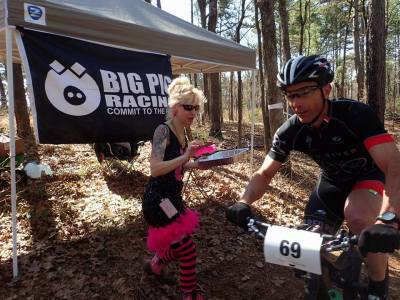 Big Pig Racing is a group of mountain bikers that have been collectively riding and racing together for over 15+ years. Among our riders and racers are athletes that have completed in numerous off-road cycling events (6hr, 12hr, 24hr, Leadville 100, Ouachita Challenge, Trans North Georgia (TNGA), Tour Divide Race (TDR) etc. as well as dozens of XC sprint and marathon distance races), triathlons (sprint, Olympic, 1/2 iron), adventure races (sprint, 12 and 24 hr), ultra-endurance running (marathons and 50 milers). It is a pretty good depth, breadth, and general wealth of experience in outdoor adventure sports, with a specific focus on mountain bike riding and racing. What started out as a group of passionate riders intending to create a very sarcastic joke, has blossomed into a highly competitive and well respected racing team. 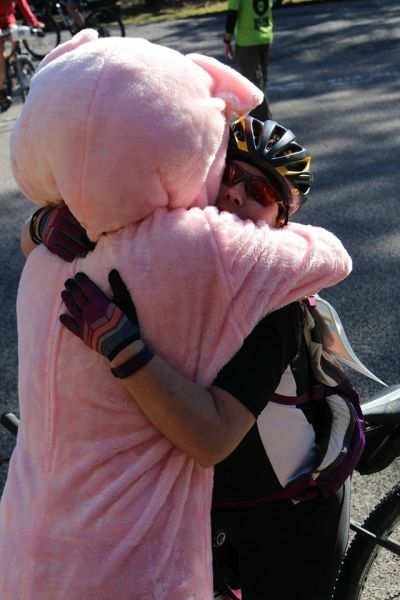 One of the most frequently asked questions about Big Pig Racing is, what is the story behind the Big Pig? On a Tuesday afternoon (in an attempt to motivate the troops), a high-powered consultant walked into one of our high-powered corporate office(s) and tried to use the ridiculous analogy listed above. That evening, several of us were on our weekly group ride, and began discussing the ridiculous nature of the story, and came to realize that it was in fact, not that silly of a story at all as it related to our commitment to the sport. As the ride continued we began discussing our own levels of commitment to the sport through racing, community and trail advocacy over the past decade, and realized we were not just participants in the sport and lifestyle of mountain biking, but we were passionate and committed riders. As a result, Big Pig Racing was born. We realized that we Commit to the Ride. In some cases the ride may be just a ride. In other cases the ride became a race, or in fact is an actual race. And in some cases it has very little to do with being on the bike. It could be about supporting local trail advocacy, mountain bike or cycling community initiatives, or just each other. In all cases, Big Pig has a commitment to everything we do. We commit to the event, each other, and the sport. We have a group of riders and racers that actually get it, and what it means to be on a bike. Because of that, we have attracted riders and racers to our ranks that wanted to be a part of something that is more than number plates and standing on a podium. Sure, most of our riders do finish well in the races, but something we do or say has struck a chord within the mountain bike community that attracts the passionate and committed riders. While Big Pig Racing started out as something tongue and cheek, and to poke fun at the far too serious nature of the world, has now grown to something that promotes mountain biking with the humor, passion, and commitment it both needs and deserves.